Lowell Manufacturing Company has published a new color catalog for its expanding product base. 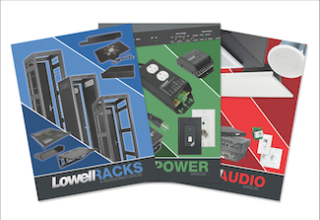 The new catalog follows the release of the other two catalogs—for rack and audio products—released earlier this year. The extensive portfolio of products includes a wide variety of loudspeaker systems, sound masking equipment, audio controls, 19-inch racks and cabinets, power distribution, and surge protective devices. Lowell catalogs can be viewed or ordered online at theirwebsite.